The 45MG is an advanced ultrasonic thickness gage packed with standard measurement features and software options. 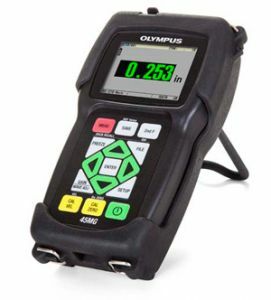 This unique instrument is compatible with the complete range of Olympus dual element and single element thickness gage transducers, making this innovative instrument an all-in-one solution for virtually every thickness gage application. In its basic configuration the 45MG is a simple and straightforward gage that requires minimal operator training to tackle most common thickness gaging applications. With additional optional software options and transducers however, the 45MG can become significantly more advanced and take on applications well beyond that of a typical entry-level gage. Furthermore, most options are available individually at the time of purchase or can be added in the future as your needs change. From a simple corrosion gage to a multi-purpose precision thickness gage with only a few key strokes. The 45MG offers five code-activated software options that makes it one of the most versatile thickness gages in the industry. Echo-to-Echo / THRU-COAT®: Using Echo-to-Echo, the true metal thickness is displayed and the thickness of the coating layer will be ignored. THRU-COAT measures metal and nonmetallic coating thicknesses, each adjusted for their correct sound velocities. There is no need to remove paint or coatings from surfaces. Single Element: For very precise thickness measurements on many materials, including metals, plastics, composites, glass, and ceramics. Compatible with single element Microscan transducers ranging from 2.25 MHz to 30 MHz. Single Element High Penetration: For thickness measurement on thick or highly attenuating materials such as fiberglass or cast metals. Compatible with single element Microscan transducers ranging from 0.5 MHz to 30 MHz. Included is the Single Element option. Data Logger: The 45MG has a full-featured internal bidirectional alphanumeric data logger that is designed to easily store and transfer thickness readings and waveform data. Includes GageView™ interface program, a Windows-based application. 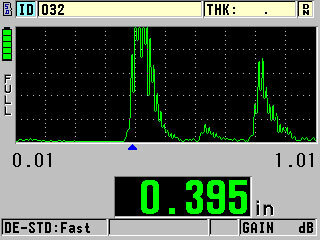 Live A-scan with Waveform Adjust: This optional Live A-scan mode allows users to view the ultrasound waveform (or A-scan) directly on the gage's display, verify the thickness measurement, and make manual adjustments to gain and blanking settings to maximize measurement performance in challenging applications. This helpful option features Manual Gain Adjust, Extended Blanking, First Echo Blank, Range, and Delay. Explosive Atmosphere: Safe operation as defined by Class I, Division 2, Group D, as found in the National Fire Protection Association Code (NFPA 70), Article 500, and tested using MIL-STD-810G, Method 511.4, Procedure I. Shock tested using MIL-STD-810G, Method 516.5, Procedure I, 6 cycles each axis, 15 g, 11 msec Half sine. 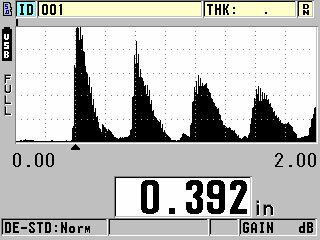 Vibration tested using MIL-STD-810G, Method 514.5, Procedure I, Annex C, Fig. 6, general exposure: 1 hour each axis.